Okay, Gerogia Clark, why are you not writing for SNL, Amy Schumer, Tina Fey and/or Amy Poehler?1 Your comedy is epic and you literally had me laughing out loud throughout the entire novel! Georgia Clark's witty and down right hilarious writing left me in stitches. She has definitely earned a place beside the best comedy goddesses. It's as if Death Becomes Her(Meryl Streep, anyone) and Girls(HBO) had a hot, steamy night and 9 months later, The Regulars was born. 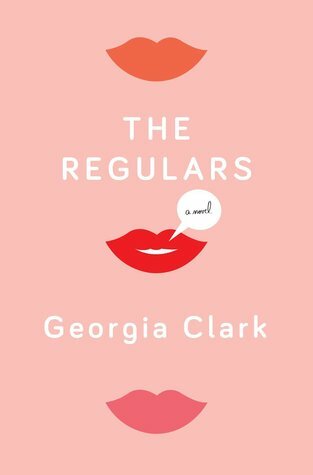 The Regulars is a multi-perspective novel, telling the story of 3 average girls, that are all striving to make it in this big world. They believe the only thing holding them back is their appearance. Well, opportunity came a-knockin' and they were "blessed" with a magical elixir that can make all their superficial dreams come true. The Regulars is filled with wit and charm, but it is also thought-provoking. You can't help but put yourself in one of their shoes and ask yourself: Would you try the Pretty? Buckle up, because The Regulars is a wild ride, but with that good time, you'll also witness the heart and soul that is loaded in this book. Yes, you'll laugh, but you'll also feel and witness these girls grow and evolve. You'll watch friendships grow, you'll watch relationships begin and end. There will be tears and at times, sorrow. This book definitely has it all! A charming cast of characters, outrageously funny and a magically good time, you will simply devour The Regulars!